A silk and wool rug feels good under bare toes, while an Arctic Pear chandelier by Ochre lends sparkle. Irving created an inviting sitting area in the couple’s bedroom. As stylish as any grown-up haven, the little girl’s room holds an Ethan Allen bed from the owners’ previous home, which Irving refreshed with a coat of white paint. A geometric Tibetan wool rug and CB2 bedding strike additional notes of sophistication. What was once a mere stair landing is now a sunny spot well equipped for private time with a plush daybed. The chic mudroom incorporates a custom shade and a handy apron-front sink for washing hands. Irving brought the dramatic color into the family room, too, coating the bookshelves and window seat as a contrast to the room’s paler walls. A favorite gathering space, the family room includes Michael Mazur’s painting White Water and a game table for hours of fun. Working with Boston’s Krakow Witkin Gallery and Jules Place, the designer and her clients found contemporary art that beautifully complements the old room. In the same congenial spirit, modern furnishings and fixtures look right at home with the living room’s classic architectural details. The old, underutilized pool was replaced with a more organic design framed by granite pavers and the occasional protruding boulder. The pub room on the lower level boasts an eclectic mix of clubby leather seating and an African table dating back to the 1940s. The owner is an avid reader who wanted a library where he could consolidate his extensive book collection. Custom shelves crafted from reclaimed white oak surround an antique English library table dating from around 1800. The rug underneath is new, but was designed to look old and distressed. The great room’s antique oak ceiling rises nearly twenty-two feet and is illuminated by French doors crowned with a solid granite lintel that took a day and a half to hoist into place. The downhill side of the barn overlooks an auto court. Nestled across the yard from the 7,000-square-foot main house, this Ridgefield retreat contains a gym, library, office, and gathering spaces—but no bedrooms, in deference to local building codes. Architect Mark P. Finlay designed it to look like an old outbuilding that had been added onto over the years. A corner table provides the perfect perch for tastings. Industrial-style stools await visitors at the bar, whose rear door leads to a wine cellar with storage for 2,000 bottles. A library features traditional furniture covered in atypical colors and fabrics, along with bright metallic accents like the coffee table’s gilded treatment. The foyer’s vivid colors, grasscloth walls, and literary references introduce visual refrains that appear throughout the inn. Bold graphics in the wallpaper and rug get a calming counterpoint in the solids Reider chose for the upholstered bed and draperies. The staircase tower, originally designed to house an observation nook, was left open to maximize light flow. The back view of the home reveals how Rousselle tucked the ground floor into the sloping site to help conceal the mass of the house and to accommodate a large outdoor patio. A potting shed off the garage boasts a classic sliding barn door. The home’s three-season, modified timber-frame screened-in porch is high enough off the ground to give it a tree-house feel. 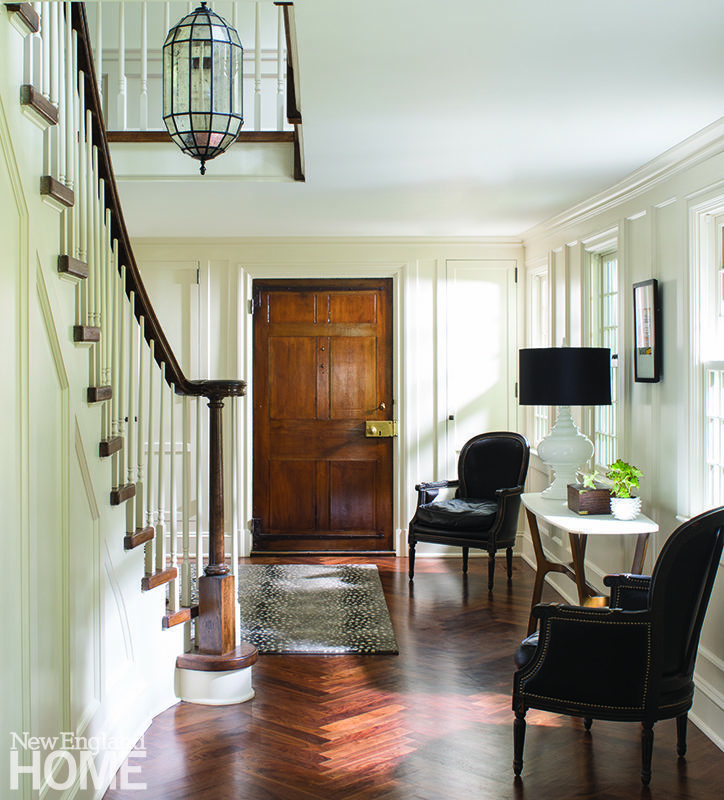 In the entry hall, natural elements such as slate, stone, and wood help marry inside and out. An open breezeway connects the house and the garage. By using a natural, neutral color palette in the great room, the design team ensured the furniture and accessories would not detract from the dramatic exterior views or the focal-point stone fireplace. 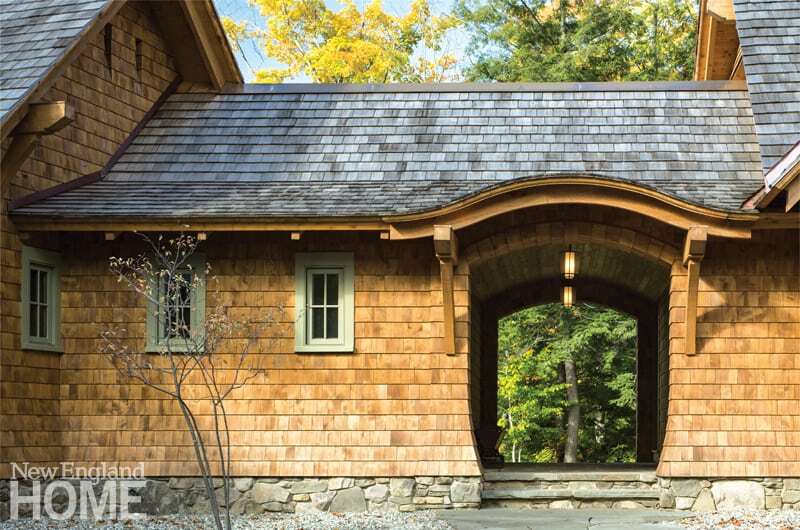 Some of the homes architectural details include hemlock brackets, flared columns, and an eyebrow arch. 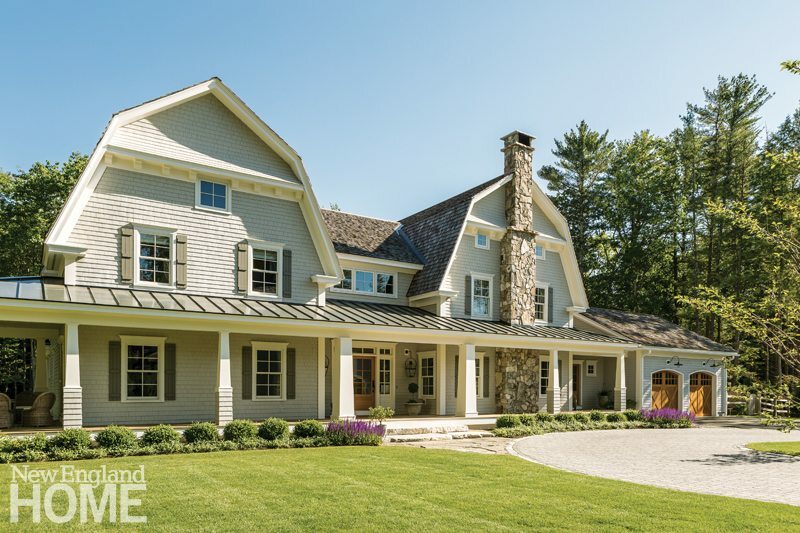 Architect Paul Robert Rousselle and his client agreed the Shingle style would be the perfect blend of classic and contemporary for this Vermont home. Rousselle varied the heights of the rooflines to reduce the home’s sense of volume, and added a host of elegant architectural details. High ceilings, elegantly simple locally sourced lighting fixtures, and floor-to-ceiling windows fill the dining room with light all year round. The rear of the house has a more classically symmetrical look. A spacious circular porch with idyllic views sits off the master bedroom. The broad back porch offers plenty of room for an outdoor dinner party. Mirrored nightstands lend the master bedroom a touch of glamour. The great room’s furniture is a bold take on classic seaside style. 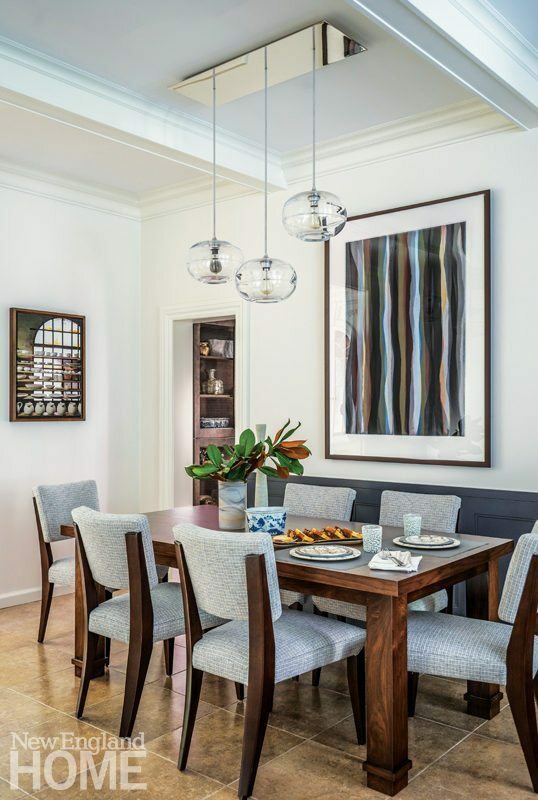 The dining area’s contemporary concrete-topped table, abstract art, and another stunning light fixture play beautifully against traditional architectural details. The designers searched out unique lighting, including the hanging sculpture by Doug Johnston in the long gallery that separates the entry from the living room. In keeping with the home’s bayside location, the family room takes on a nautical flair with beachy colors and a cleverly designed barrel-vault ceiling. 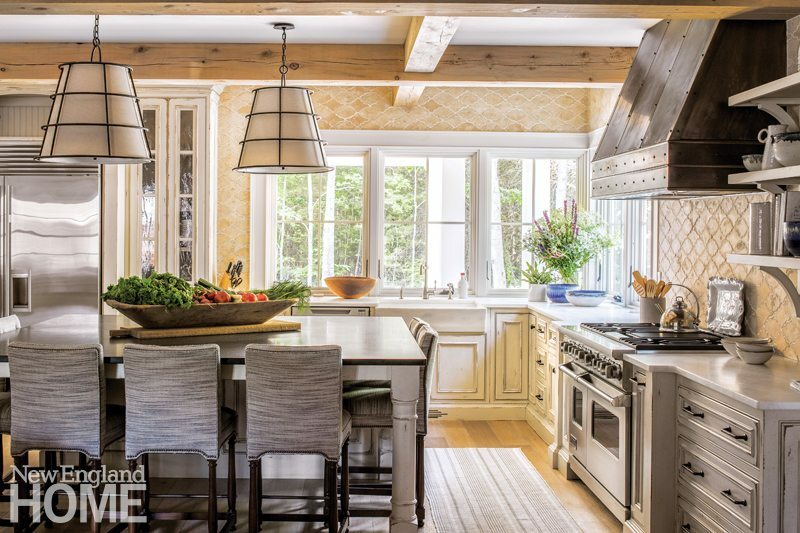 Architects Arthur Hanlon and Joseph Goncalves designed a house that presents the classic Shingle style in a refreshing new way. Unexpected elements include the asymmetry of the front facade, upper windows with muntins only above eye level, and a projecting tower to hold the main staircase. Bright pops of color and ethnic patterns bring a youthful feel to a bedroom. The study features darker colors and materials and a bold, graphic rug. The master bedroom draws from a lighter seaside palette of colors and textures for a serene look and feel. The sunken living room’s expansive windows frame the drop-dead view. 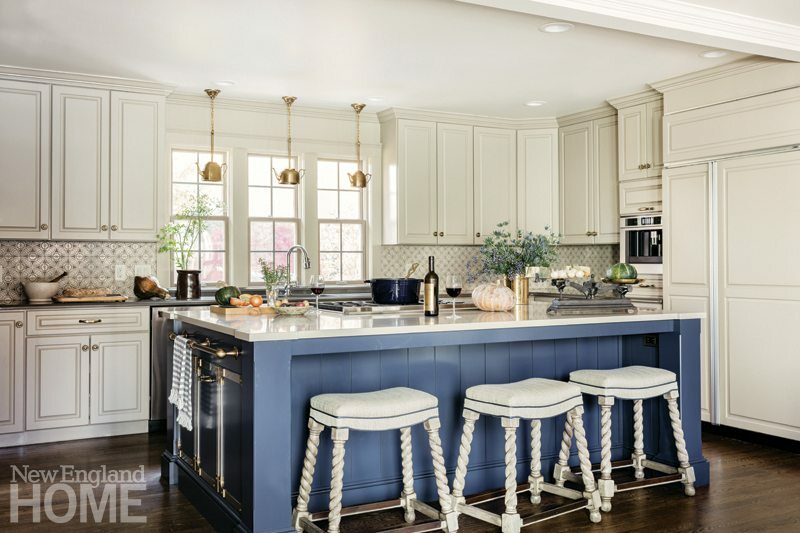 A curvy drive meanders through a wooded lot, ending at the entrance to the classic Shingle-style home, never letting on that spectacular water views await within. The front hallway is punctuated with bold blue ocean hues. A wood and rattan side table, topped by a 1940s painting, is a classic touch in the contemporary setting. The sloping lot offers extensive views of the bay beyond from the home, from its many terraces and patios, and from the deck surrounding the infinity pool. The pool house is an architectural nod to the main house. Local fieldstone visually links the house with the terrace areas. Pale shades of sand and sea reflect the home’s location. An elegant but relaxed design scheme is evident in the living room and the dining room beyond. An environmentally protected coastal bank provides a natural buffer between the pool and the bay. A grouping of Italian furnishings makes an appealing vignette alongside the window. The plant-filled patio speaks to the owner’s passion for gardening. Twin sheds and a shade-lending pergola anchor the pool area and complement the house. “Soft melon and cream are colors the owners have always preferred,” says interior designer Richard FitzGerald, referring to the pastel-hued living room. Details often found in the classically inspired work of Royal Barry Wills Associates include the quoining along the corners of the main block of the house and the full-length shutters that flank the first-floor windows. Traditional plants such as tailored boxwood and blue hydrangeas complement the elegant architecture. The owners covered the entry’s original brick wall with meticulously painted and glazed woodwork; light wood and a big mirror make the small space appear larger. Builder Craig Ashworth rescued the corner cupboard from another home and installed it here, much to the owners’ delight, where it houses a growing collection of fragile oyster plates. Lustrous antique silver lends character to the refined dining room. 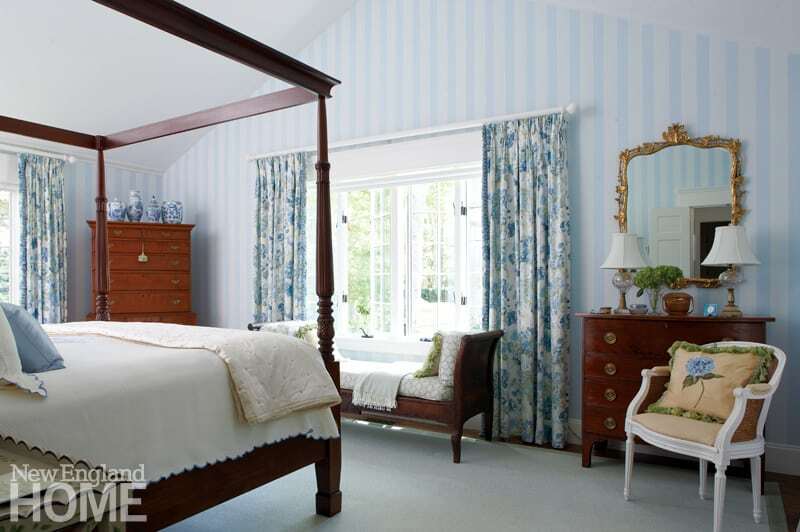 The master bedroom features a number of antiques, including a gleaming highboy—the ideal staging area for an assemblage of blue and white porcelain. The 1860 Boston brownstone was converted back to a single-family home. Lounge chairs help keep the living room as comfortable as it is elegant. With no kids or pets in residence, the homeowners embraced this pale, custom-designed rug by J.D. Staron. 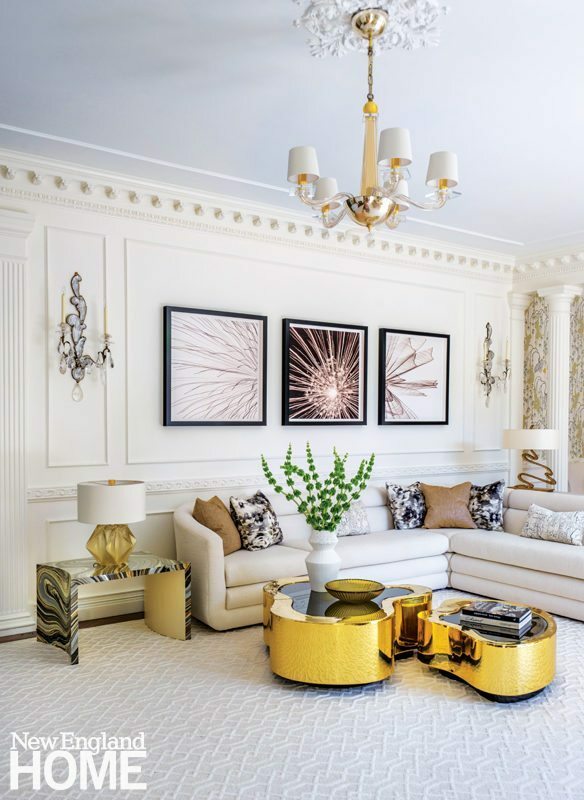 Photographs by Jim Nickelson add a graphic punch, and gold coffee tables gleam at the center of it all. Heather Kahler from Downsview Kitchens of Boston brightened up the kitchen, which had been moodier in its previous incarnation. A guest room used by the couple’s adult daughter when she visits boasts a custom Phillip Jeffries wallpaper embellished with a white embossed design. Fauteuils from the homeowners’ prior home flank the painted limestone fireplace. A paper sculpture by Matthew Shlian hangs above a console by Holly Hunt, one of many gilded pieces throughout the home. The marble floor and wrought-iron banister already in place helped inspire the “Paris apartment” feel of the redesign. Designer Starr Daniels painted the stair steps black and added an animal-print runner for a chic, modern look. 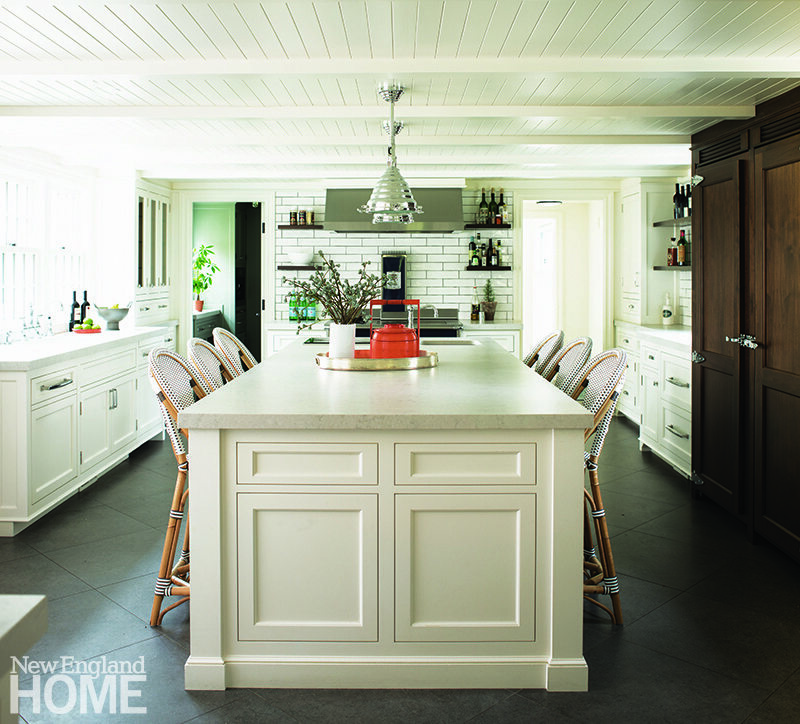 The designer’s comprehensive approach extended to the placement of the owner’s Nantucket baskets and boxes on the living room’s étagère. The serene master bedroom is a study in quiet neutrals and soft textures. The Josephine sofa from J. Robert Scott makes the living room a favorite spot for snuggling up with a book on a sunny afternoon. A few large, simple furnishings, including sofas in muted colors, help scale the great room down to human size, but the custom Holly Hunt chandelier bespeaks rustic grandeur. 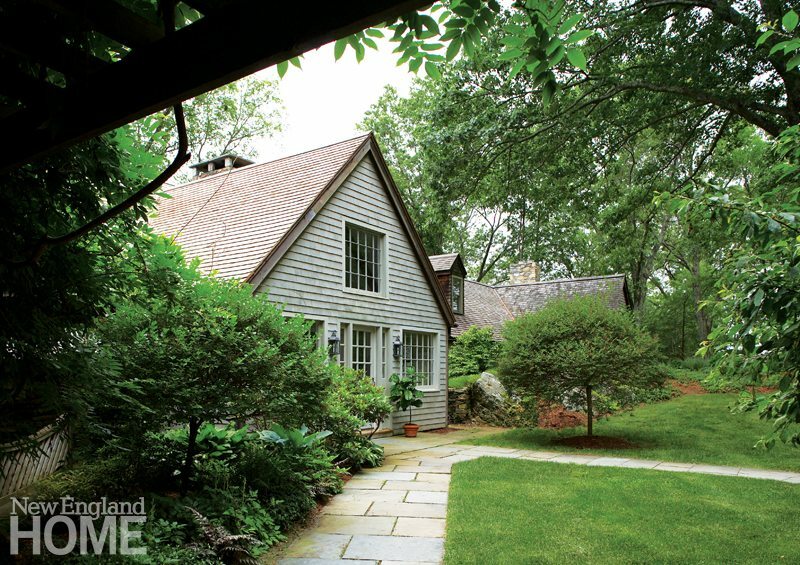 A modest shingled exterior belies the home’s light-filled interior spaces. High-peaked rooflines hint at the multiple vaulted ceilings inside. 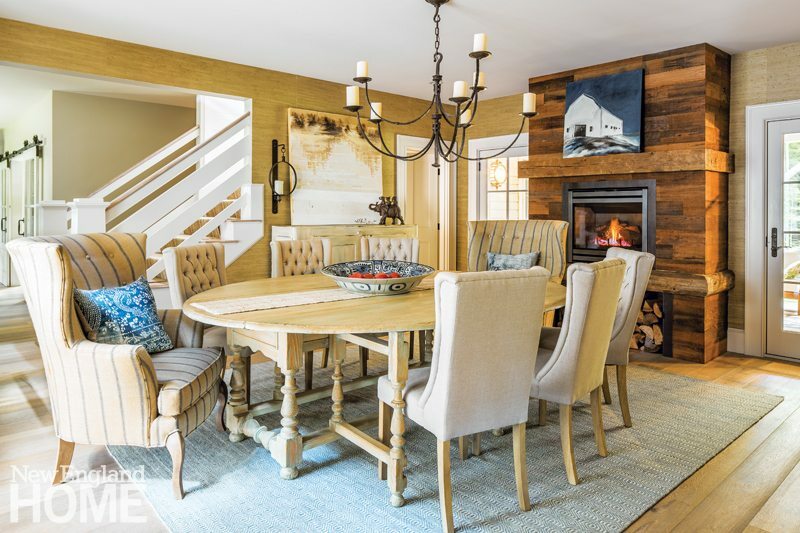 Typical of the home, the dining room blends the owner’s collected possessions—table, chairs, and artwork—with new lighting, rug, and wallcovering. Iconic Eames walnut stools are part of the room’s playful mix of patterns and textures. The homeowner designed the Chippendale-style headboard for the master bedroom. Traces of paint purposely left on the hefty beams speak to the home’s age and its long line of inhabitants. Down-filled cushions make the antique French sofa as comfortable as it is chic. 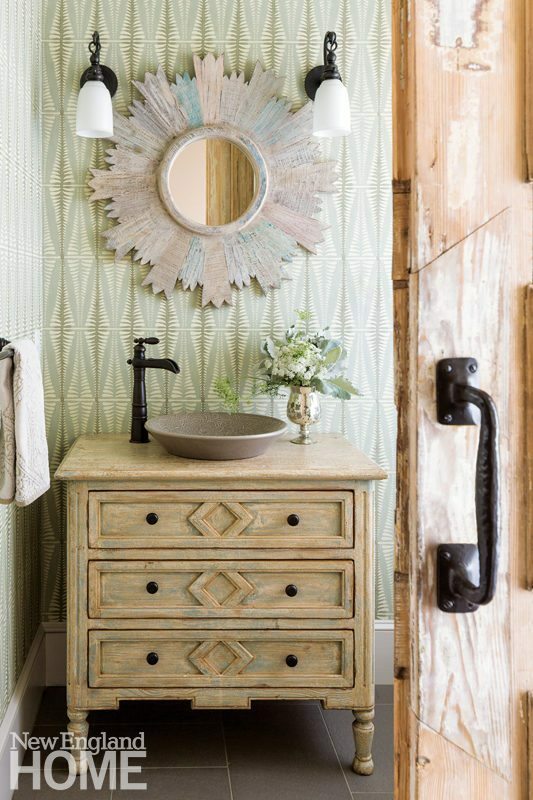 Interior designer Jenn Sanborn chose to keep the entryway’s existing wallpaper, then introduced vintage pieces both to add a layer of interest and to offer a preview of the home’s casual English country vibe. In the master bedroom, a luxuriously upholstered bed and geometric grasscloth wallcovering replaced a spartan four-poster and bland painted walls. The master bedroom’s fireplace, like the others in the house, was converted from gas to wood burning. A soffit was extended to provide the great room’s new barrel ceiling a place to land. It also allowed the designer to inch the sofa forward by placing a thin table behind it. Wall paneling cures multiple ills in the great room by giving the small firebox more presence while minimizing the impact of the television. 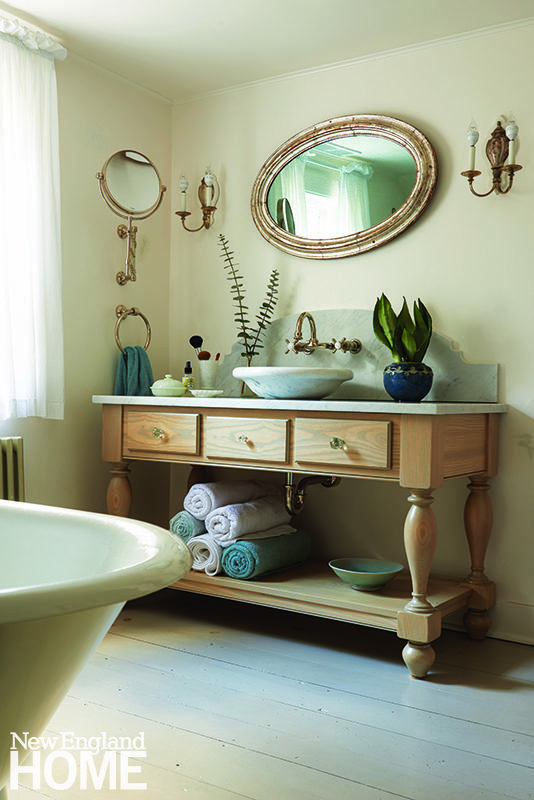 An antique hall rack hits a traditional note in the entryway. The antique pool table, turned chair, and Scottish tartan rug reference a country manor, but the purple walls, upholstery, and mantelpiece disrupt any presumptions. The sitting room got new life as a billiards room.